Only 13% of U.S. companies have a unified process to measure and report consumption of energy across their business activities (in comparison to 50% of global companies with a unified process). Only 10% of the 1000 largest publicly listed companies disclose environmental, social, and governance (ESG) performance data in a coherent way. From 2008-2011, the percentage of U.S. N100 companies with GRI reports increased from 74% to 93%. From 2010-2011, there was a 46% increase in number of GRI reports (from 187 to 273 reports). BrownFlynn’s hypothesis for the growth in U.S. GRI reports relates to peer pressure. Several news articles highlight how companies are striving to be more sustainable to please stakeholders, such as employees and investors. BrownFlynn has also noticed that competition is driving sustainability initiatives. When two recent clients inquired about BrownFlynn’s reporting services, they mentioned that their CEOs noticed competitors’ sustainability reports and wanted to write one as well. Company leaders are starting to realize the benefits of sustainability reporting and do not want to follow behind their competitors. 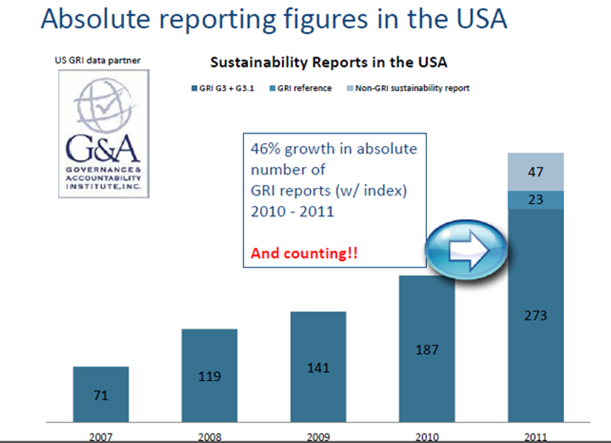 What can we do to accelerate sustainability reporting in the U.S.? BrownFlynn, along with other members of the sustainability network, should continue to emphasize the business benefits of sustainability programs and reporting. Sustainability reporting is an excellent management tool to help company leaders understand their ESG impacts, set goals, create action plans, and monitor progress. The GRI Process, September 25-26 in Palo Alto, CA. Spotlight on Governance, October 2 in New York City, NY. The GRI Process, October 17-18 in Cleveland, OH. The GRI Process, November 13-14 in Detroit, MI. We train attendees across business industries. The Head of Professional Accountants in Business of the International Federation of Accountants, Stathis Gould, commented that “BrownFlynn’s GRI training provides insights into not only the GRI reporting framework and performance indicators, but also how the sustainability and integrated reporting process can drive better governance and management processes to support sustainable success for organizations.” In order for the United States to continue to be a world leader, businesses should take advantage of sustainability initiatives and reporting. Other countries have already recognized the value of sustainability reporting. The results are evident and the benefits are proven. Why not join the sustainability reporting bandwagon?